We tend to get in dinner ruts pretty often in our home. Once we find a meal that we love, we’ll eat it over and over again until we eventually feel the need to move onto something new. Right now, our rut is centered around these quinoa bowls. If my husband had his way, he’d probably have a quinoa bowl for dinner every night, forever. He loves them that much. And I can’t complain, because this type of dish is so easy to prepare! But, I do try to switch up the ingredients often, just to make sure he’s not eating exactly the same thing every night. This variation is his new favorite, featuring a quick teriyaki-style sauce. It calls for coconut aminos, a soy-free alternative to soy sauce, but it can also be made with tamari or regular soy sauce, if you prefer. Paired with protein-rich quinoa and a touch of pure maple syrup, fresh ginger, and garlic, this flavorful dish is something you’ll want to eat often, too! What I especially love about this recipe is that it can be prepared in practically no time. When I know I’m going to be rushed, I’ll prepare the quinoa ahead of time and rely on frozen vegetables instead of fresh, for a meal that can be ready in 10 minutes or less. Just heat and serve! In a small saucepan over high heat, combine the quinoa and water and bring it to a boil. Cover, then reduce the heat to low, allowing the quinoa to cook for 15 minutes, until all of the water is absorbed. Fluff the cooked quinoa with a fork, and set aside. Melt the coconut oil in a large skillet over medium heat, and sauté the chopped onion and pepper for 5 minutes. 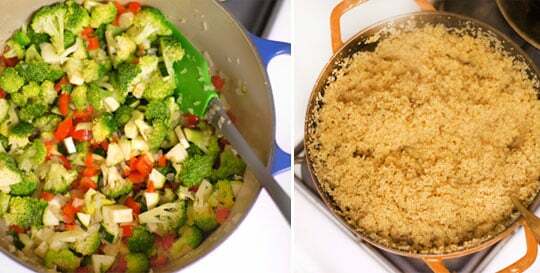 Whisk together the sauce ingredients, then add the broccoli, zucchini, and sauce to the skillet, and stir well to coat. Cover the skillet with a lid, and allow the veggies to steam in the sauce until tender, about 8 to 10 minutes. Add in the cooked quinoa, and stir well to make sure the sauce is evenly distributed. Season with salt, if desired (additional salt isn’t necessary when using tamari or soy sauce), and serve immediately, with a garnish of sliced green onions, if desired. 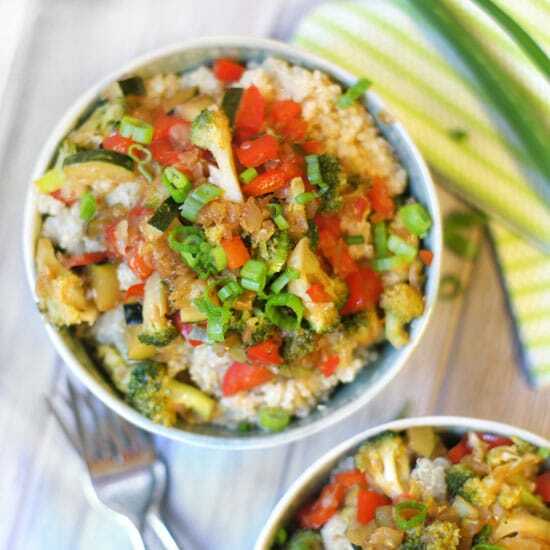 An easy vegetarian dinner that can be whipped together in no time! Add in the cooked quinoa, and stir well to make sure the sauce is evenly distributed. Season with salt, if desired (additional salt isn't necessary when using tamari or soy sauce), and serve immediately, with a garnish of sliced green onions, if desired. This recipe is soy-free and gluten-free when you use coconut aminos. If you don’t need to avoid soy products, you can use tamari as a gluten-free soy sauce, or regular soy sauce, if you prefer. 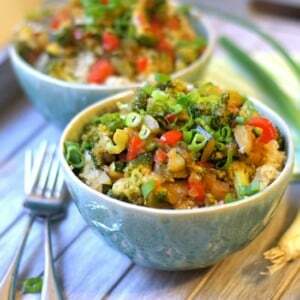 This recipe can be easily adapted to use any veggies or grains that you have on hand. If you prefer brown rice or millet, feel free to use anything you like in place of the quinoa. (You could even try cauliflower rice as a grain-free option.) You can use any other seasonal veggies, too! Reader Feedback: What’s your go-to dinner lately? Do you eat the same meals often? The recipe is good but the servings for 2 is too much. 1 cup of uncooked quinoa is 635 calories. I made it to 5 servings and stored them for portion control. Can you substitute Braggs for Tamari or Coconut Aminos? I’m a huge fan of yours! I’ve made so many of your recipes. This is one of my favorites – I make it at least once a month! I am just cooking for myself so it makes 4 meals for me. The leftovers are awesome as long as I remember to undercook the peppers and zucchini a little bit to begin with – then they don’t turn into mush when reheating. 😉 Anyway, just had to thank you. Please keep the recipes coming! I’ve got a mushroom Gruyere pie in the oven even as I type! We tried this today. Used asparagus because it is in season instead of zucchini. It was my second meatless Monday and what a great tasty meal. so i was wondering, for the detoxinista, are you challenging gluten free girl and gluten free on a shoestring? im just wondering cos im a gluten free gal. This was really great, simple and delicious. Hubby and I devoured it, I will never buy Teriyaki sauce again! Finished it with sesame seeds and a drizzle of sesame oil, fantabulous! Thanks for the inspiration, it means a lot that you share your discoveries so openly, much gratitude! “This recipe is also perfect for anyone dealing with multiple food allergies.” It makes my mouth water to read this recipe, but unfortunately it does not cater for those with fructose intolerance. With an adult son who is highly fructose intolerant, so many recipes do not cater for these people. Garlic, onion, honey are just some of the foods that cause havoc with his digestive system. Thanks for the recipe! I’ve been craving teriyaki for days now and I’m not sure why because it’s not a dish I typically gravitate towards. But there you go. I’ve got all the ingredients and I’m going to go make it tonight. Dinner dilemma solved. Bon appétit. This was recipe was great! Do you have a breakdown of calories, etc per serving? I’m trying to track using my fitness pal. Thanks for the info on the lemon juice and maple syrup. I also cannot have vinegar citrus, or anything acidy. I really don’t know what to use in the place of these. Sue, my MIL is the same. We just leave it out of salad recipes that we make for her if it is small amount, or make a different dish for her as some dishes need the acid to work. It takes some experimentation. I just thought of a dumb question for you and all readers. Does food grade essential oil, such as lemon, have the same acid content? It has the nice lemon flavor. I’m curious and it could help folks like Sue B. and my MIL. Also, how can you not know what maple syrup is…?! And why are can’t you have these things? Haven’t tried this yet, but is sounds so good. I can’t have citrus, so what could I use for the lemon juice? I also can’t have sugar, does the pure maple sugar have sugar or corn syrup? You could use apple cider vinegar instead of lemon juice, but I’d only use half the amount listed, as vinegar is more pungent. Pure maple syrup is a natural sugar, so there is no added sugar or corn syrup. I get in dinner ruts all the time. My problem is I typically eat the same thing for breakfast and lunch, and try to switch it up for dinner…but I feel like I am always looking for something new to serve. This will be a great edition to my dinner menu. I love teriyaki bowls :). Thanks for sharing! I can’t wait to make this recipe! I can’t wait for your book, when is it coming out? Thanks! The book is scheduled to hit the shelves in 2015, so we have a wait ahead of us… but hopefully pre-order information will be available by the end of the year. I had no idea that teriyaki sauce was so easy to make. I’m holding a bottle of store bought sauce and the second ingredient is sugar!!! No wonder it tasted so sticky sweet. I’m really trying to cut down (out if possible!) refined sugars so I’m glad you posted this. I like how you used maple syrup instead as I am able to buy a organic and natural product at a local roadside stand with no additives. Also, I went back to read an article you wrote about why fat doesn’t make you fat and was quite intrigued. Really, all stuff that I’ve been thinking all along but wanted that confirmation! Thanks! Will continue to eat healthy fats like avocados and nuts. I actually started to lose the baby fat when I started to eat more almonds. The rest is history, all 50 pounds came off in about a year! Yay!!! Thanks for such wonderful ideas, Megan!